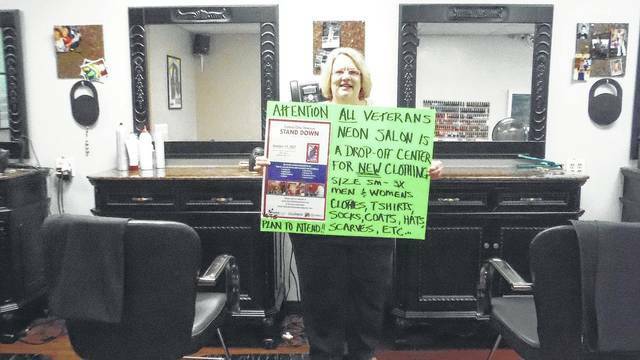 A Sunbury woman is collecting donations of new clothes where she works in preparation for an event to help Central Ohio veterans. New garments will be accepted now through Oct. 4 at Neon Salon in Sunbury, which is in a strip mall along Routes 36/37. The clothes will be given away at no cost to veterans at the Central Ohio Stand Down, Oct. 17 in the Greater Columbus Convention Center. The drop-off box wasn’t available during a visit to the salon on Tuesday, but donations can still be made. Pinson has made a poster and had signs printed up, and received permission to do the project. Pinson, who has lived in Sunbury for 34 years, has personal reasons for volunteering with Stand Down. 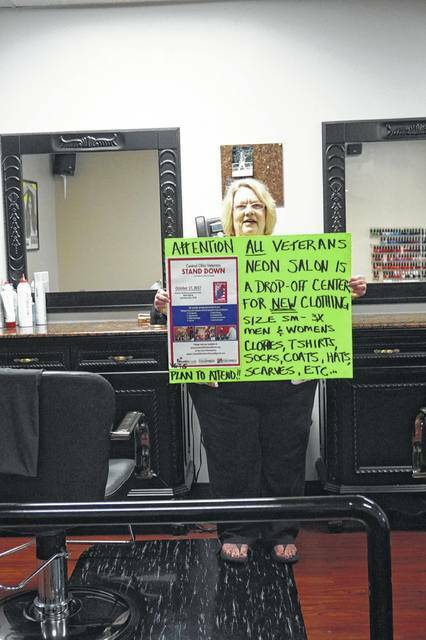 In the case of the Central Ohio event, veterans will be able to receive free goods and services, such as haircuts, health screening, housing information, job search information, legal services, and a pair of Rocky Boots. Last year, 532 veterans attended the Stand Down in Columbus. Although this is the first year the Neon Salon is helping with the Stand Down, the all-volunteer organization has been around locally for 25 years, and began nationally in 1988. For the clothing drive, Neon Salon wants new coats, hats, hoodies, jeans, scarves, socks, and underwear. Neon Salon is at 482 W. Cherry Street, Sunbury. The Salon’s hours are 9 a.m.-8 p.m. Monday-Thursday; 9 a.m.-5 p.m. Friday; 9 a.m.-noon Saturday; closed Sunday. For more information, call the salon at 740-965-2005.